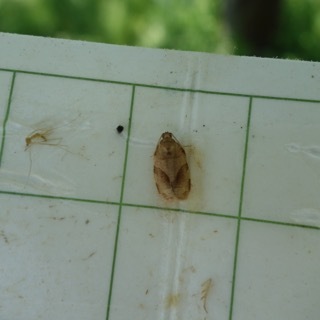 Codling Moth (CM) -- 1st generation, first sustained trap catch biofix date: May 18, Wednesday. Codling moth development as of May 31: 1st generation adult emergence at 40% and 1st generation egg hatch atr 0%. 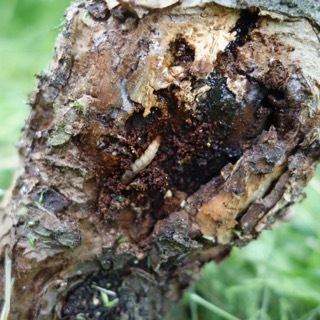 In most orchards, insecticide targetted against plum curculio and apple maggot prevent codling moth damage. If targetted codling moth control is needed, key management dates are: 1st generation 3% CM egg hatch: June 4, Saturday = target date for first spray where multiple sprays needed to control 1st generation CM. 1st generation 20% CM egg hatch: June 11, Saturday = target date where one spray needed to control 1st generation CM. Obliquebanded Leafroller (OBLR) -- 1st generation OBLR flight begins around; June 5, Sunday. Where waiting to sample late instar OBLR larvae is not an option (i.e., where OBLR is known to be a problem, and will be managed with an insecticide against young larvae): Early egg hatch and optimum date for initial application of B.t, Delegate, Proclaim, Intrepic, Rimon, Altacor, Belt, pyrethroid or other insecticide effective against OBLR (with follow-up applications as needed): June 21, Tuesday. Oriental Fruit Moth OFM -- 1st generation OFM flight starts: April 23, Saturday. 1st generation 55% egg hatch and first treatment date, if needed: May 27, Friday. Plum Curculio (PC) -- Increased risk of PC damage as McIntosh and similar varieties increase fruit size: May 22, Sunday. Earliest safe date for last PC insecticide spray: May 25, Wednesday. Spotted Tentiform Leafminer STLM -- 1st STLM flight, peak trap catch: May 8, Sunday. 1st generation sapfeeding mines start showing: May 21, Saturday. Optimum sample date is around Sunday, May 22, when a larger portion of mines are visible. 2nd STLM flight begins around: June 13, Monday. Rough guess of when 2nd generation sap-feeding mines begin showing: July 3, Sunday. 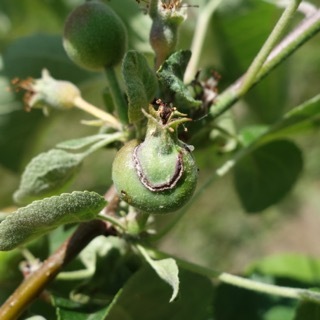 NEW: Apple Bud Freeze Mortality Estimates -- Date: Wednesday, April 6, Estimated Potential Bud Freeze, 44%; Date: Tuesday, April 5, Estimated Potential Bud Freeze, 39%; Potential Cumulative Crop Recuction, 66%. Preliminary McIntosh Harvest Date Forecasts -- Date to apply ReTain to delay first harvest for apples which without treatment would be ready for storage harvest on September 4 is from Sunday August 7 to August 14. 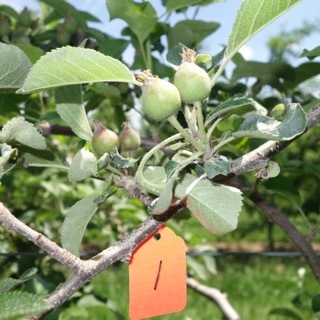 Date to apply ReTain to delay maturity for 2nd, 3rd or 4th pick of those apples, without delaying start of harvest maturity, is from Sunday, August 21 to August 28. Begin measuring actual McIntosh starch-iodine index no later than Thursday, August 1. The Michigan formula estimates that non-spur McIntosh will reach starch index 4.0 and start the optimum harvest window for long term storage on Sunday, September 4. Using the Champlain Valley NY formula, McIntosh maturity is forecast to reach starch index 6.0 in Belchertown MA on Thursday, September 15. 15-June, 2016 (Wednesday) Orchard, Berry & Grape Field Day, Belltown Hill Orchards, 483 Matson Hill Rd., Glastonbury, CT. 2 PM to 8 PM. No cost to attend, dinner at 6 PM. Sponsored by CT Pomological Society, UConn Extension, CT Dept. of Agriculuture, and USDA Risk Management Agency. Field Day flyer. 13-July, 2016 (Wednesday) Massachusetts Fruit Growers' Association Summer Meeting, UMass Cold Spring Orchard, 391 Sabin Street, Belchertown, MA. Details TBA. The apple crop is shaping up, but it depends. In the Worcester hills and points east the crop looks pretty good, at least 75-80% of normal. Colder sites fared worse. In the Pioneer Valley, well, things are not as good. The crop out there might be 50%, but again, it depends somewhat. I have not see the hill towns or Berkshires, I suspect they fared better than the Valley. All-in-all, it ranges from disappointing to meh to "what's the problem?" 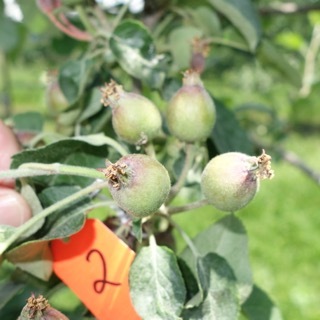 If you need to do some thinning, as fruits approach 18 mm, NOW is your last chance to apple carbaryl, NAA, or 6-BA. Expect moderate thinning at best at this point given the fruit size and weather. As you will see below, diseases are, well, can we just get over scab? (Yes, mostly.) Insects have exploded in the past week with the warm-hot weather. Be on the lookout. Is anyone going to be terribly disappointed if we don't have any June twilight meetings and the fact the MFGA Summer Meeting is July 13 in Belchertown? 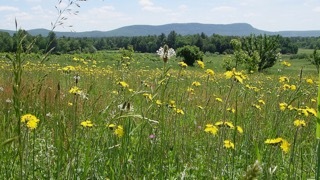 It was a beautiful day to be scouting orchards here in Western MA! Insects love this weather too. Plum curculio activity has just about reached an end, but not quite. In high-pressure blocks you may want to consider one last spray, if you aren’t currently covered. Oviposition scars are easily seen on fruitlets now. 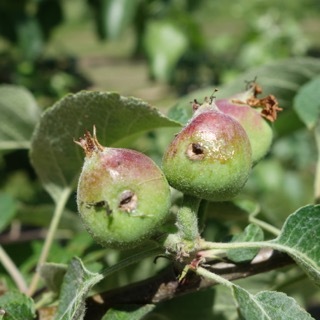 You may also be seeing European apple sawfly scars as well. Unfortunately in this case, that means the window for damage control has closed. Both of these pests were tricky to control this year as bloom dragged on and on (and on…) making petal fall insecticide applications a little dicey. The good news just keeps coming! Oriental fruit moth, which has been flying since late April, is still out and about. Those of you who haven’t sprayed your peach blocks with an insecticide this year might want to keep an eye out for shoot tip flagging, possible evidence of newly hatched larva feeding inside the tender green tissue, if you look closely you may even see the oviposition wound. The next opportunity to treat OFM will be coming up in late June, early July, if warranted. Mating disruption is a good tool to use for this pest. There has been some debate (at least between Jon and I) as to whether or not OFM will move into apples to lay their next round of eggs with no peach crop this year. First generation adult codling moth is also out in force. Thankfully, insecticide applications targeted at plum curculio and apple maggot should clean this one up too. Rounding out the lepidopteron trifecta this week is the obliquebanded leafroller. No sustained trap captures, yet, but the first has been found in a pheromone trap. It’s too soon to treat for this just yet, again, looking into late June for an insecticide application. Some good news here, though, the treatment windows overlap nicely, so, one good spray application may do. You didn’t think I was done yet, did you? One last pest to trot out. Pear psylla, yep, they are still around. If you head out and scout your pears now, you will see adults active. Take a look at last week’s Healthy Fruit for recommendations and application timing for this pest. Plum curculio were active little buggers last week! They got going when fruit size was 6-7 mm and the heat and humidity set in. Recommendation: PC activity should be subsiding, if you have covered with insecticide in the last week, you should be all set. Otherwise, Imidan is the gold standard for PC control. 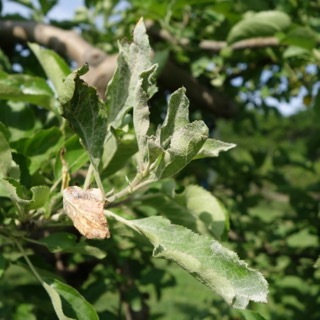 European apple sawfly damage is significatn in orchards with poor pre-bloom or petal fall insecticide coverage. 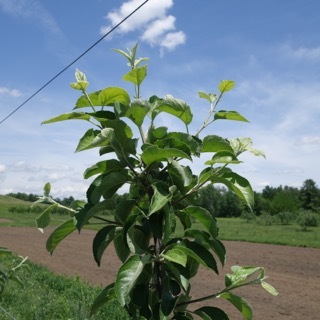 Recommendation: too late to do anything now, hand-thin damaged fruit, be ready next year with pre-bloom and/or petal fall insecticides (Imidan). Lesser peach tree borer caught in pheromone trap. Recommendation: mating disruption should be up by now, or you will have LPTB laying eggs in scaffold limbs and causing damage. If no mating disruption, consider an orchard-wide (peach) insecticide spray of a pyrethroid (Asana, Pounce, Warrior) ora pre-mix such as Voliam Express (which would be good if you think you have an OFM issue). Oriental fruit moth in pheromone trap. 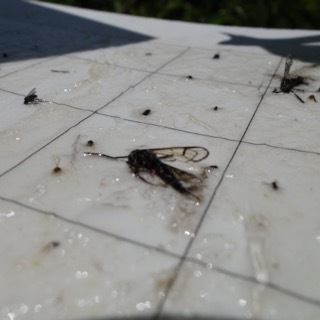 First sustained catch/biofix was about a month ago, so they have been flying, mating, and laying eggs in peach shoot tips (unless you killed them with a petal fall spray); soon, flagging shoot tips would be evident of infestation and need to control (again). Recommendation: mating disruption is effective if previously deployed. (Too late now.) 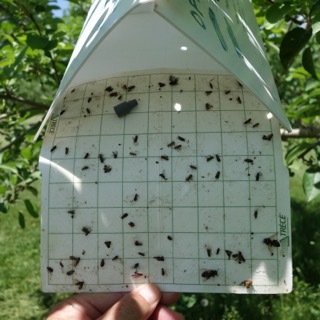 If you find evidence of infestation (flagging shoot tips) in peaches, an insecticide application (in peaches, see 2015-16 NETFMG for options) might not be a bad idea so the next generation will not be allowed to find your precious apples and lay an egg on them. 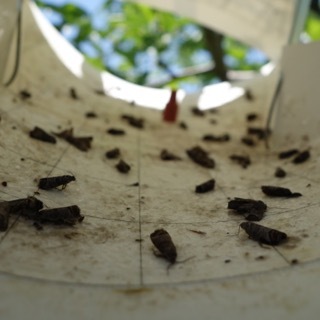 Codling moth in pheromone trap. First sustained catch, and biofix set sometime in the past two weeks. Some orchards have annual problems with CM, some do not. Recommendation: if treatment is warranted, time insecticide application using DD model. If using NEWA for Belchertown, "First Trap Catch: 5/26/2016. Pest Stage: Moths flying & first eggs laid. Pest Status: First eggs are laid at about 50 DD (current 16) and the first eggs usually hatch after about 220 DD. Pest Management: Apply insecticides that need to be present before egg laying at about 50-75 DD. Apply insecticides that target early egg laying period at 100-200 DD. Pesticide information (see 2015-16 NETFMG) but Altacor, Delegate, Proclaim, Belt (among others) good Reduced Risk options." Obliquebanded leafroller (one) caught in pheromone trap. Lonely male or female to date. Wait until 3-4 moths are caught in succession before setting biofix. Recommendation: wait until biofix set to time treatment. You can also scout for larval infestation of foliage in a couple weeks, but if you have significant trap catch, you likely have a problem worth treating with insecticide. See The obliquebanded leafroller model, but, treatment typically happens last week in June through first week in July. See 2015-2016 NETFMG for treatment options. 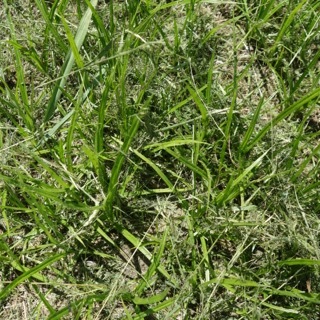 Yellow nutsedge: a difficult to control, perennial grass-like weed that often escapes herbicide application and grows best in fine-textured, wetter soils. Recommendation: spot treatment? apply Casoron (in fall), Gramoxone (burn-down, apply now), Rely (or equivalent, apply now for burndown), Sandea (read label), or Roundup (late in the season, be careful). 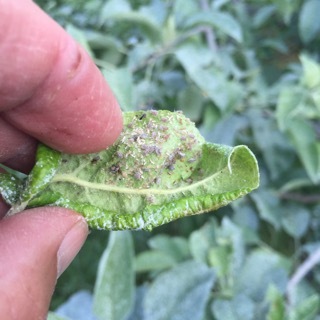 Green apple aphids are prevalent now. Recommendation: usually nothing, as aphid predators (lacewings, etc.) will keep in check. 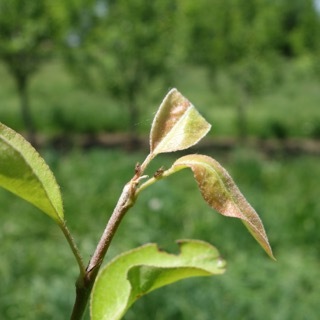 Young trees just planted might warrant treatment if aphids are excessvie. Recommendation: these little buggers are tough nuts to crack. Control can be a season-long battle (multiple generations) if not nipped in the bud early. Toast these adults right now with Danitol (or similar), then consider an application of Centaur or Movento in a week or so timed to stop hatching nymphs from successfully changing to adults. Dogwood borer in dwarf tree rootstock. Ugh, a bad situation. Recommendation: keep bases of dwarf apple trees clean, i.e. free from weeds and debris. Scout for infestation (a fun job). Deploy mating disruption. Use Lorsban as a directed spray to trunks/bases of trees during the month of June. 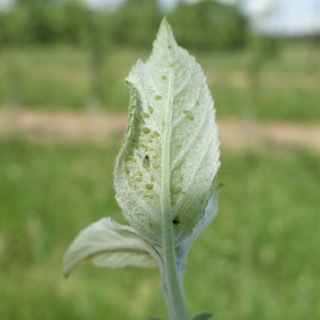 Rosy apple aphid (RAA) on curled apple leaf. Recommendation: RAA is a sporadic pest, but can be a significant problem on Golden Delicious and a few other varieties. Pre-bloom insecticides are most effective when there is a problem. Now, a systemic insecticicide (Movento is the gold standard) is the only answer. Well, we do IPM right? Then see next pict too. 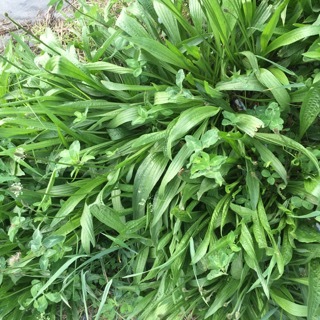 Narrow leaf plantain is a broadleaf weed that is the summer host to RAA. Scab – please make it stop! 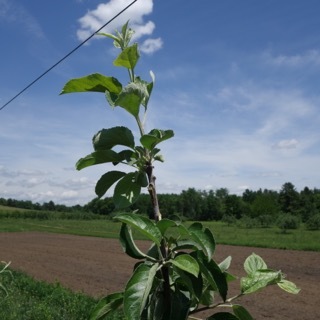 NEWA has been saying that we were done with primary apple scab for over a week, and that the last primary infection should show symptoms by June 2 to June 7, depending on where you are in the MA. Remember that it takes time from the last infection period during primary spore release for any possible infections to show. For Belchertown, that date is June 2. Unfortunately for those of you who want to forget about scab and get on with other apple growing business, Ag-Radar and RIMpro and our direct observations to date all point to a few ascospores left for this coming week in Belchertown. I think that because it was dry over long stretches this spring, the maturation process got dragged out. There probably will be a few primary spores left for the next rain. Having said that, are those spores really important? There’s taller grass, more time for earthworms to eat leaves, and it’s a really small portion, maybe 1% or less of the total inoculum for the season. I don’t think it’s important, unless you had really bad scab last year. I think the last rain, Monday May 30, was the last meaningful infection period. That means in about 10 days, we’ll know if there were any infections from it, and if not, can finally stop scab sprays! 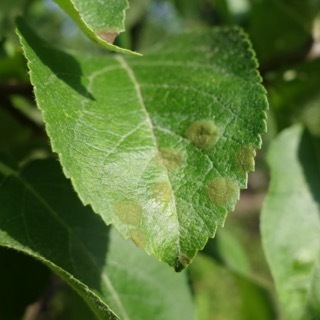 Apple scab lesions on unsprayed trees started showing up 1-2 weeks ago. BTW, if you are seeing any of this now, well you better keep spraying fungicide (Captan) when it rains. Damn! A reminder to strip young tree leaders to keep them reaching for the sky! The next Healthy Fruit will be published on Tuesday, June 7 (or thereabouts), 2016. As always feel free to get in touch with any member of the UMass Fruit Team (http://extension.umass.edu/fruitadvisor/team-members) if you have questions or comments.